Notice love is not one of those emotions, even though it seems like it should be the most important, it’s not. Since I love Savy so much, I try to help her and make her work easier, but this only creates more problems. I have many ways of showing her I love her: I let her lean on my inside leg, I release the outside rein, I release the reins completely or push my hands forward so that she doesn’t really have to be on the bit, I lean forward, I throw my hips forward, I don’t make her march at the walk, I let her run around the arena totally strung out, and I’m sure Nicole know of many other ways I try to make life easier on Savy. In my mind I’m telling her I love her, but all Savy is thinking is “Haha sucka! Now I don’t have to work as hard”. I’ve been trying for months to stop myself from doing this, but subconsciously I still want to. The truth is that I feel guilty when I make her work hard and do something she doesn’t want to do. Savy is a willful, stubborn, 5 year old Arabian mare. She’s sassy and opinionated. Riding for her isn’t about love, it’s about work and dominance. She wants to be the leader of our 2 member pack and each time I ease up on her and make things easier, she’s becoming more of the leader than I am. The turning point in my mindset happened several weeks ago at an Alfredo Hernandez clinic when he addressed the same issue with one of the riders. He said you love your horse 23 hours of the day, but for 1 hour, the horse has to work (I’m paraphrasing because he said it much more colorfully than that). So I’ve decided to trust the advice of professionals and take my loving feelings completely out of our training. I’m not talking about respect, kindness and fairness, those are at the foundation of successful training, but love in the sense that I stop letter her take advantage of me. I will no longer be a passive rider. And let me tell you, Savy is pissed! Super, super pissed. Savy is beyond angry that I’ve been making her stay bent to the inside without releasing the outside rein and stay in front of my leg. She is outraged and she’s fighting with all of her might to remain the leader of our pack. And so begins the toughest time in our training history. Our lesson last night was tense and stressful for all of us; me, Savy, and Nicole. Nicole had me sit with a strong core, not leaning forword and not letting Savy pull me forward and with my elbows glued to my side. I had to stay strong in my position until Savy released her neck and jaw. The entire time using my legs to push her forward into the contact. At one point I think both Nicole and I weren’t sure if she was going to give. But finally, finally she did and we were able to get beautiful, supple, round trot work. She even stayed round in the extended trot with no fuss. It can be easy to get discouraged when we go through these rough patches. Sometimes I feel like I’m no better of a rider than when we first started training a year and half ago and that we’re making no progress. But then I remember that we went through the same thing last year teaching Savy to stretch over her back. 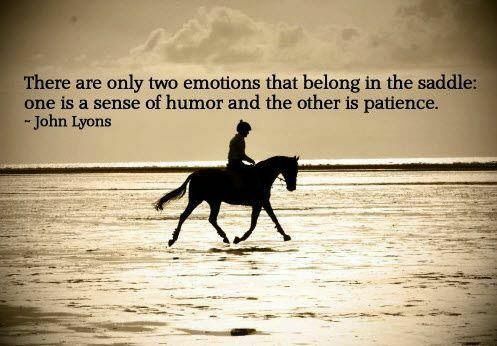 Now Savy has an awesome stretchy walk, trot and canter. Something that used to be incredibly difficult is now one of our strongest points. So I know that once we push through this challenging phase, Savy will be solid in her beautiful round, engaged frame. This is what our last 5 rides have looked like…. 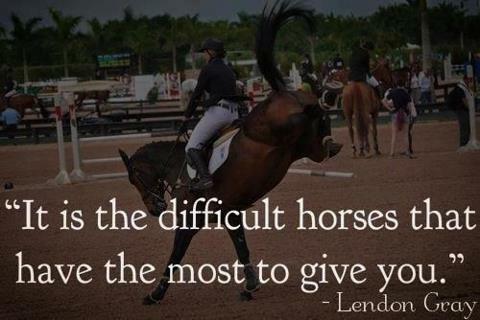 This entry was posted in Uncategorized and tagged Challenging Horses, Dressage, Engagement, Harrington Dressage, John Lyons quote, Lendon Gray quote, Nicole Harrington, Savy. Bookmark the permalink.